The rise and fall of German idealism: Christian Wolff: Reasonable thoughts of human acting and letting others act upon you - What's on your mind? Christian Wolff: Reasonable thoughts of human acting and letting others act upon you - What's on your mind? If you have always wondered how to find out what other people have in mind, Wolff instructs how to do it. One might wonder what this has to do with the topic of Wolff's German ethics. Well, in order to do good things, you must learn what is good and what is not – and one way to do this is to see what others think is good. Wolff's method is rather simple. Suppose a person perceives or otherwise experiences some situation and in her imagination and memory she has a maxim telling whether such a situation is good or bad and what one should do in that sort of situation. Then through a simple syllogism we see that the person will evaluate the situation and act in a certain manner. So, if a person sees a beggar and her maxim is to donate to the poor, she will give an alm. Then again, we can also reverse the process. In other words, if we know the particular experiences a person has and the actions following from these experiences, we can instantly know what general maxims she follows in her actions. Thus, if we see a person giving a fiver to a beggar he has just seen, we can suppose that the person has a general maxim of helping the poor. Of course, it is not as simple as that, because people can act contrary to their maxims, if they feel the need to deceive other people. For instance, the person giving the alms in the last paragraph might only want to make an impression to a lady who truly likes charity. Generally, the possibility of deception prevents us to be truly certain of what is going on in other people's minds. Wolff suggests a method for circumventing the possibility of deception. Although one's actions can be deceiving, emotions cannot be – that is, if a person thinks some situation to be good or bad, we can assume that she will generally evaluate similar situations in the same manner. Hence, the person trying to fool a lady with a generous gift to the beggar would be instantly revealed by his emotion that he disliked his act of charity. Maxims could thus be read from emotions, but how can emotions of a person be deciphered? Now, as we might remember from Wolffian psychology, Wolff's and Leibniz's dualism with a pre-estabished harmony verges on materialism. Indeed, because of the harmony, one can at least in principle find out what emotion a soul is feeling, when one is studying the corresponding body. Indeed, we do evaluate the emotions of people by looking at the expressions of their faces and other non-verbal forms of communication. But Wolff goes a step further and appears to accept the validity of physiognomy. Physiognomy is a discipline of great antiquity: there is a book called Physiognomy, which was ascribed to Aristotle, although the author was probably just a member of the Aristotelian school. The basic idea behind this discipline is rather simple – by studying the physical characteristics of a person we could determine also his mental characteristics. Classic physiognomy appealed, for instance, to resemblance with other animals – if he looks like a pig, he is probably going to behave like a pig. Physiognomy was criticised even during Wolff's life and is nowadays dead as a dodo when it comes to respectable science, but similar statements can be found in more modern disciplines. For instance, genetic determinists are certain that the personality of a person is completely encoded in her DNA. 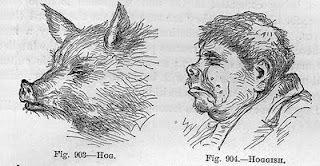 Thus, Wolff's readiness to accept physiognomy implies that he might not be completely against these later theories – genetics would not then be in contradiction with Wolffian dualism. Yet, Wolff did not accept even physiognomy wholly, because of a point familiar from the genes-environment -discussion: while physiognomy might be correct of human beings in their natural state, education can change the temperament of a person. Ironically, Wolff has more difficulties in combining the possibility of educating a person with his view of the human soul: because human soul is actually closed up from external influences, it cannot really be educated, that is, other people only seem to educate the person, who then develops freely from his natural state. Nevertheless, Wolff admits that physiognomy is not a reliable method for deciphering people's emotions, and thus the hopes of reading other people's minds have been destroyed. This appears to be a common theme in Wolff's philosophy: he sets out an ideal of knowledge and even develops a method for acheiving it – but in the end, human frailties hinder the use of the method. Next time, we shall look at the duties of a moral person.